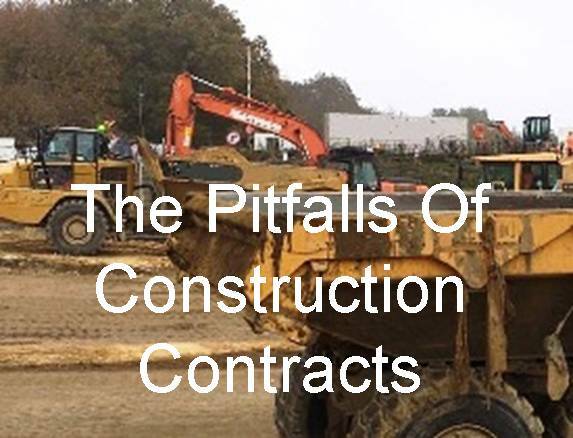 Futher to my recent post "Understanding Construction Contracts" I have been reading an interesting piece of research, from Bibby Financial Services, that reveals just how much of a problem contracts can be to subcontractors within the sector. There were a number of pitfalls of construction contracts that were identified in the survey. In addition to affecting your ability to get paid, contractual problems can also stop you from being able to raise finance against projects. Almost 1 in 5 (19%) said that they don't throughly check contracts, before they sign them. My other article highlighted the potential for clauses that might cause you not to be paid, or not be able to raise funding against a contracts, if they are present in the small print. Reading the contract, and getting advice where required, is essential not to mention good practice in any sector. 38% said that they thought that construction sector contracts were too complex, and hence difficult, to understand. If this is the case, you should seek legal advice, or the help of a Quantity Surveyor, to explain your contractractual obligations in layman's terms. 27% said that they needed help checking contracts. My other article highlighed penalty clauses - such as liquidated damages, collateral warranties & bonds, as an issue for subcontractors. Penalty clauses set out the financial consequences, should a subcontractor breach their obligations. The Bibby survey found that 20% of respondents had been adversely affected by such penalty clauses, a huge number - again 1 in 5 respondents. My other article advocated negotiating the removal of certain clauses, however the survey found that only 42% felt that they were able to influence the terms of the contracts that they entered into. 55% felt that they had to accept the contracts as they were, in order to avoid losing business. Financiers such as Bibby Financial Services can help you raise money against construction sector work. Please use this form to request a construction finance quote from Bibby Financial Services. Alternatively, contact FundInvoice or call Sean on: 03330 113622, and we can put you in touch with other financiers that specialise in the construction sector. Source: Bibby Financial Services - Subcontracting Growth Survey between 21/09/16 and 06/10/16. 250+ respondents from the UK across different sub-contracting trades. Participants had average turnover of £2.3m pa and less than 250 employees. Trades included: General building, electrical, plastering, dry lining, rendering, plumbing & heating, engineering, painting & decorating, ground works, roofing, window fitting, joining, flooring, installation, demolition, waste management, carpentry, partitions, curtain wall installation, fencing, manufacturing, roads and motorways & other specialised activities.